I wanted to post a recipe for a favorite dish of ours, a robust stew of ground turkey, salsa, and beans topped with a cheesy crust. Unfortunately, it looks like … mush. It’s completely beyond my current skills to get a photo that makes this dish even look edible, never mind appetizing. We’ll continue making it, and I’ll pull out the camera each time. Hopefully, I’ll get a good shot. Meanwhile, let’s talk salmon. Leftover salmon, to be specific. When we have salmon for dinner, I make extra. The firm texture and fattiness (healthy fat, remember!) of salmon mean that it holds up well in cold dishes. 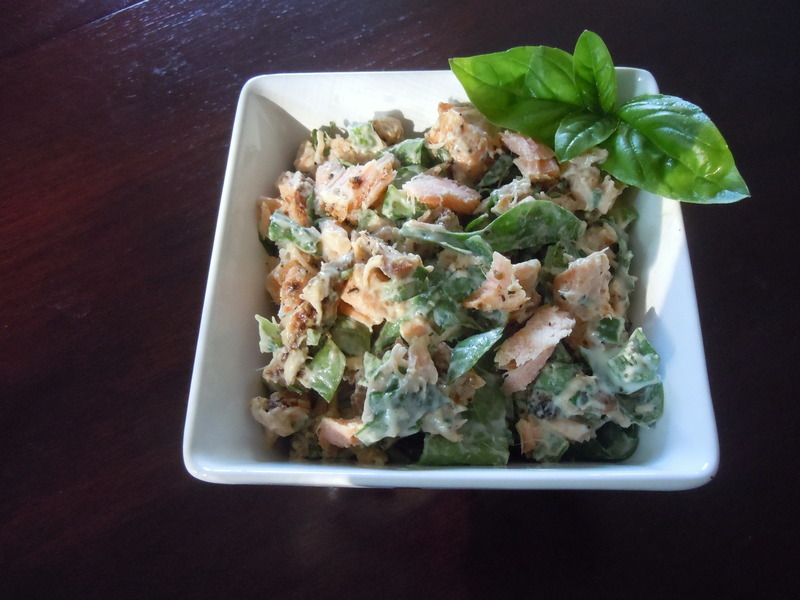 Arctic char (a salmon relative) and fresh tuna can also be used in these salads. 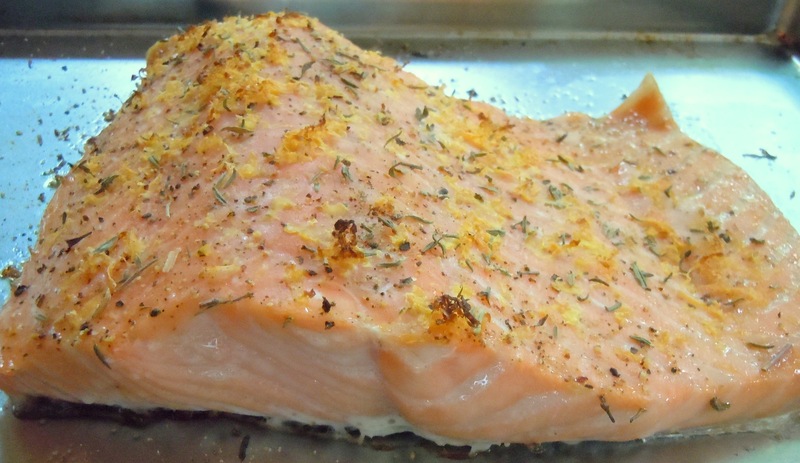 Cook the salmon like this, or use your favorite method. Chill the salmon well. Flake it and gently fold in the other salad ingredients. Bind the salad with wasabi cream, if that fits with the flavors you’re using. Or use straight mayo, a mayo-sour cream combination, or homemade low-fat ranch dressing. 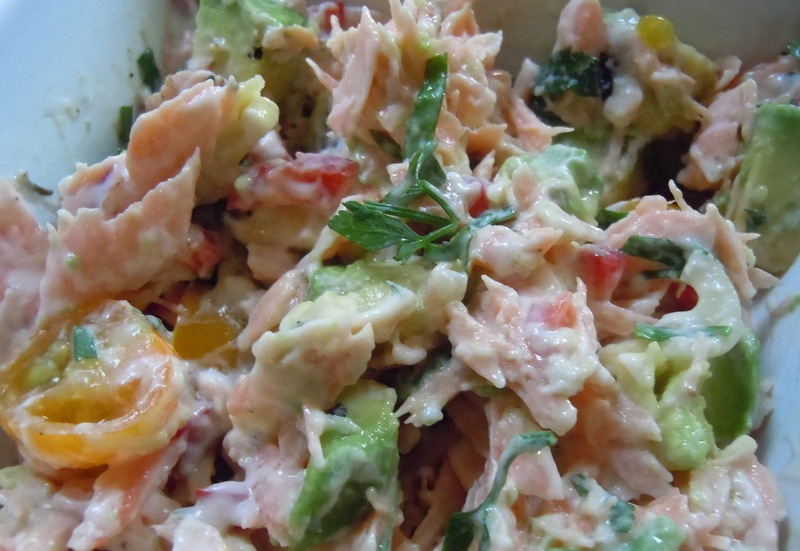 The first salad adds creamy avocado and bright cherry tomatoes to the salmon. It’s held together with the ranch dressing and accented with fresh herbs and a sprinkling of grated parm. There are plenty of great chefs who shudder at the thought of cheese with fish. If you agree with them, leave it out. Here in Cheesehead Land, anything goes (with cheese, that is). 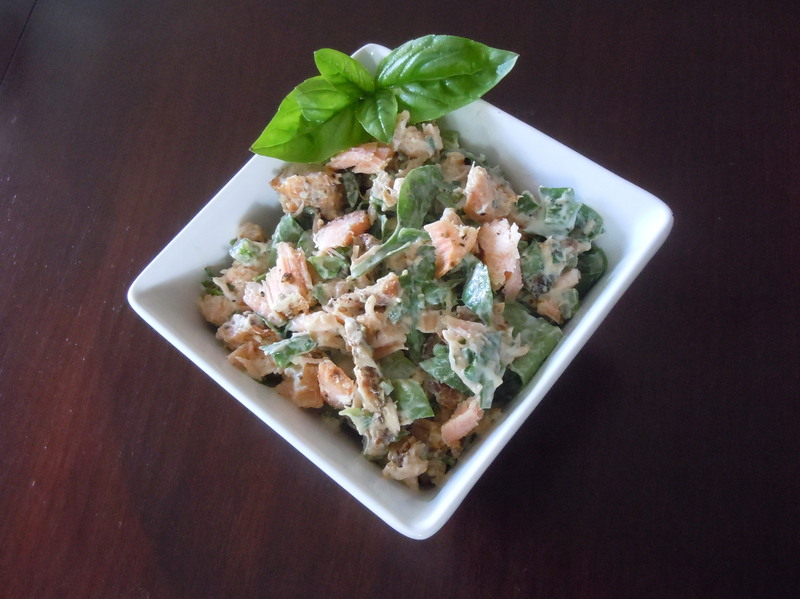 The second version combines fresh spinach and salmon with the wasabi cream. Wasabi’s sinus-clearing heat is tempered by the sour cream and rich salmon. Deep green spinach contrasts nicely with the rosy salmon, and brings some serious nutrients to the party. Both of these salads are easily doubled. Serve them as is, or on a bed of greens, or as a sandwich filling. With your fingers, gently break the salmon into bite-sized pieces, discarding any skin and gray-brown bits. Peel and cube the avocado; halve the cherry tomatoes. Add the scallions, dressing and parmesan (if using) and fold together. Taste and add salt and pepper if you feel the salad needs it. Garnish with parsley and serve. 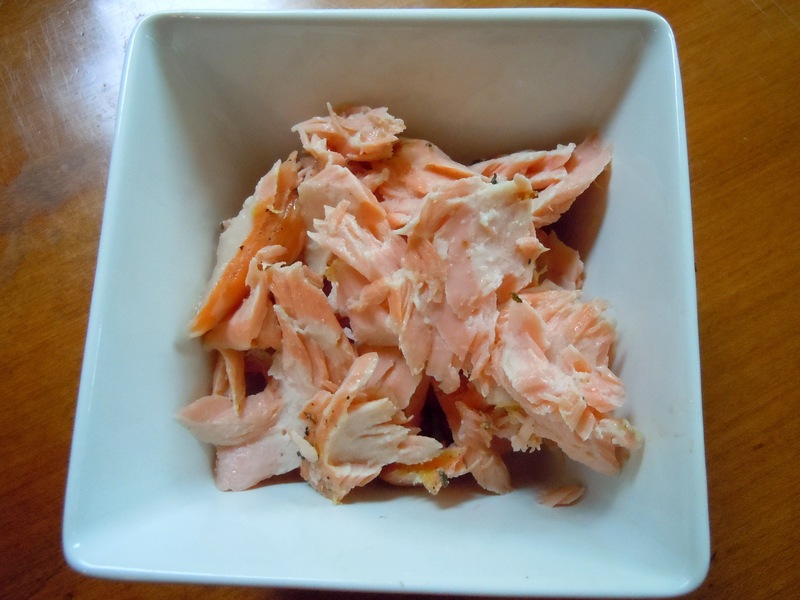 With your fingers, gently break the salmon into bite-sized pieces, discarding any skin and gray-brown bits. Give the spinach a rough chop (or use the whole leaves) and add to the salmon with the scallions and herbs. Gently fold in the wasabi cream. Taste, add salt and pepper if you wish, and serve. This entry was posted in main courses, meat, poultry,and fish and tagged avocado, basil, mayonnaise, ranch, salad, salmon, spinach, tomato, wasabi. Bookmark the permalink.